COMSTOCK PARK, MI - Minor League Baseball and the West Michigan Whitecaps, in partnership with Family Fare, announced today that the West Whitecaps will become "Las Calaveras de West Michigan" for three games during the 2019 season, all on Saturdays: May 11, July 13 and August 17. These games will be centered on celebrating the Hispanic/Latino culture and the influence it has had on America's pastime. The Whitecaps are one of 72 Minor League teams participating in the 2019 "Copa de la Diversion," or "Fun Cup," the Hispanic/Latino fan engagement initiative. "This program is aimed at connecting the teams to their communities," Whitecaps President Steve McCarthy said. "For the Whitecaps, it's allowing us to both demonstrate our commitment to diversity and provide a wide selection of fan engagement offerings." Calaveras, or skulls, are an important part of Hispanic culture. Skulls made out of sugar are decorated and used during Dia De Los Muertos (Day of the Dead), a festive and colorful Latin holiday that originated in Mexico thousands of years ago, during which families celebrate the lives and legacies of deceased relatives. The uplifting holiday recognizes death as something to celebrate as part of the cycle of life. Calaveras can also refer to mock-obituary poems that playfully poke light-hearted fun at living people. Baseball is a sport that embraces families and celebrations, and the "Calaveras de West Michigan" alternate persona of the West Michigan Whitecaps will bring Fifth Third Ballpark to life to celebrate the vibrant local Hispanic/Latino community and its traditions. Fans will enjoy sugar skull decorating, face painting, authentic food and music, games and more when Las Calaveras de West Michigan take the field. "Our desire is to reflect the community, whether it's our game-day employees, our front office or our fans," McCarthy said. "The core values of this community reflect the core values of Minor League Baseball - family, community, entertainment and tradition. This is an opportunity for us to grow." The Calaveras logo is a unique take on a sugar skull, viewed at an angle to suggest motion and competitiveness as the team swings for the fences. Inside the decorative skull logo are subtle references to the Whitecaps and West Michigan. The eyes are baseballs inside the 616 West Michigan area code; also look for baseball bats, home plate, a W and M, the team's original logo from the 1990s, and seagulls and waves representing the Lake Michigan shoreline. The "Copa de la Diversion" initiative seeks to connect MiLB teams with their diverse communities, embracing the culture and values that resonate most with Hispanics and Latinos. The initiative launched with 33 participating teams in 2018 to great success and overwhelmingly positive feedback, and the program is more than doubling in size to 72 teams for its second season. 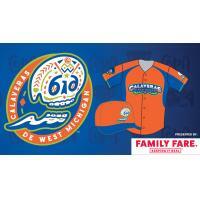 For more information about Calaveras de West Michigan, or to buy tickets or merchandise, please visit https://www.milb.com/west-michigan/fans/copa. The Whitecaps open their 26th season on Thursday, April 4 at 7:05 p.m. at the South Bend Cubs. The home opener is set for Saturday, April 6 at 4 p.m. against the Cubs. Season, group and individual tickets are now on sale for all games, including the three Calaveras de West Michigan games. Complete ticket information, including season and group ticket prices and perks, is available at www.whitecapsbaseball.com.